Media Temple is an advanced host with servers and plans targeted toward large businesses and enterprises. It’s a great option for enterprises running sophisticated websites, such as large news networks, content creators and developers with clients in each of these categories. It also offers several plans optimized for WordPress. Let’s examine how well this host is able to power your WordPress site as well as other sites in general. 17 Who is This Host for? Media Temple was founded in 1998 in Los Angeles, where its headquarters is currently located. The company hosts over 1.5 million websites in 100 countries from over 125,000 customers, customers that include Adobe, CBS and Samsung. They offer several different types of advanced hosting options, which include shared hosting that falls somewhere in between typical shared hosting and VPS hosting. They also offer managed WordPress hosting, VPS hosting, dedicated hosting and AWS cloud hosting. Media Temple also offers separate AWS cloud hosting and managed WordPress hosting plans for enterprises. They also support over a dozen additional apps, including ZenCart and Drupal. Let’s talk about what “shared hosting” means when it comes to Media Temple before we dive into pricing. This is because its pricing may make you raise an eyebrow at first glance, but the prices reflect the fact that Media Temple’s shared hosting differs greatly from the shared hosting most hosts offer. It’s not VPS hosting where your site shares the same hardware as other sites but has its own isolated area to keep its resources safe, but it also isn’t the same as cheap shared hosting environments where your site has a high likelihood of going down if another site hosted on the same server uses up too many resources. It’s powered by what Media Temple calls “the Grid,” which is a clustered architecture “built around shared clusters of high-quality server hardware, networked together to make the most efficient use of resources.” These servers are also powered by LAMP, or Linux, Apache, MySQL, PHP, Perl and Python. Sites are also stored on SSDs rather than HDDs, and you’ll perform administrative tasks using the Grid Control Panel. 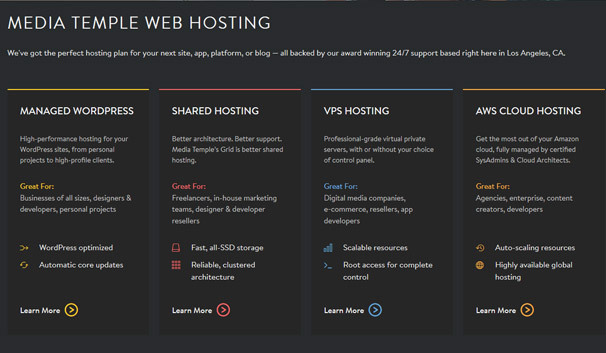 As for pricing, shared hosting has three tiers, which range from $20/month to $150/month. They all have different limits on the maximum number of websites and databases you’re allowed to create, ranging from up to 100 to up to 2,500. 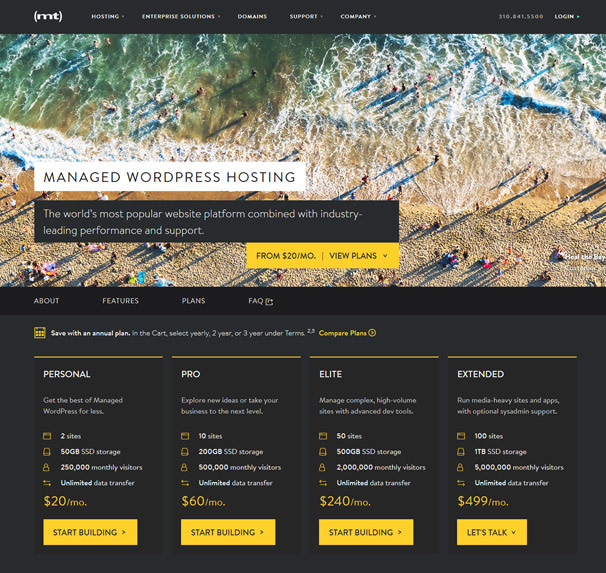 Managed WordPress hosting has four tiers that range from $20/month to $499/month. You can host between up to two and up to 100 sites on these plans, and storage limits range from up to 20GB to up to 1TB of SSD storage. They can also handle between up to 250,000 and up to 5 million monthly visitors. Media Temple offers three types of VPS hosting. The first is self-managed VPS hosting where, you guessed it, you manage everything yourself and run everything from the command line. Plans start at $30/month, and you have the option of choosing between Ubuntu, Debian and CentOS. The second is managed VPS hosting where some parts are managed by Media Temple and you run everything from a control panel. Plans start at $55/month, and you can choose between Plesk® Onyx or cPanel® & WHM® 11.5. The third option is fully-managed VPS hosting, which is a great option for businesses. Everything is managed by Media Temple, and plans start at $254/month. Dedicated hosting from Media Temple is aimed at enterprises as plans range from $2,000/month to $2,699/month. These servers can handle using up to 10TB of bandwidth per month with 128GB of RAM and dual multi-core Xeon processors. AWS Cloud Hosting is an entirely different beast powered by Amazon Web Services. This type of hosting is targeted toward agencies, large businesses, content creators and developers. Plans for this type of hosting feature custom pricing. 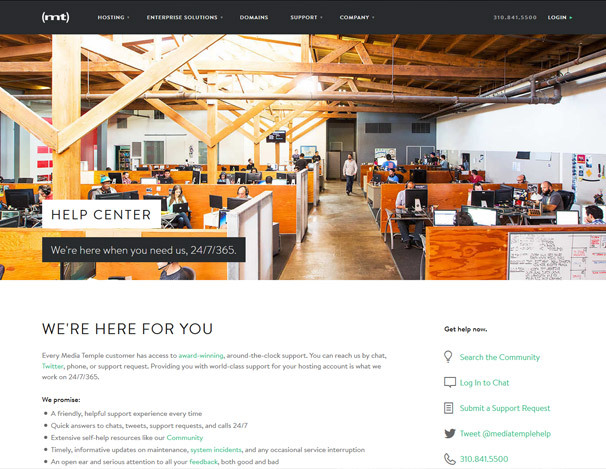 Support is available 24 hours a day, 7 days a week and 365 days a year for all customers. It’s available in every form imaginable, whether it be live chat, phone, a ticket and even Twitter. Media Temple also offers community support via forums, a knowledge base as well as a status page you can use to check whether or not things affecting your site are happening to the entire server. Let’s go over the advantages you’ll experience if you choose to host your site with Media Temple. Media Temple offers some of the most advanced and powerful servers of any hosting company. Many of their servers are optimized for larger businesses, especially media sites storing and streaming thousands of media files. It’s also a great option for developers as its servers can handle the large sites developers’ clients need, and some plans have developer-friendly features. Media Temple offers several different options and features for WordPress users and developers. It also offers a staging feature developers and advanced WordPress users can use to build new sites and test changes to existing ones without risk. Developers can also run certain tasks with the command line with WP-CLI, and all WordPress plans come with automatic core updates with the option to delay these updates for as long as 30 days. Media Temple offers several layers of security that vary depending on what type of hosting you’re using and even what plan you’re on. For starters, many plans offer malware detection and removal via SiteLock as well as 24/7 DDoS protection. You also have the option of adding a CDN to your site. Media Temple may not be cost effective for bloggers, but their shared and managed WordPress hosting plans are cost effective for medium-sized bloggers and businesses. Media Temple offers a lot of features, but it does have its disadvantages. The first one touches on the last point made in the pros. Small businesses and bloggers, especially first-time bloggers, don’t have many options when it comes to Media Temple. The cheapest plan can power as many as 100 sites while most businesses only need one. Media Temple does not use cPanel. It uses its own control panel called the Grid Control Panel, requiring you to learn an entirely new control panel before you get on with building your site. We’ve already touched base on this a few times, but this host is for large businesses, especially enterprises, and professional developers who build powerful websites for these types of businesses. The cloud hosting plans, for instance, are ideal for media companies who need to store and stream thousands of media files. If you’re a developer who builds websites for these types of clients or a blogger or business owner with a high-traffic website, give Media Temple a try with our coupon code, which gives you access to a 20% discount on managed WordPress hosting plans when you use code ALIENWP20 at checkout. Learn more here, or use the link below to get started.